Denton County families that sell with us earn an average of $350 at each sale and so can YOU! Be a part of the JBF Community and get rewarded! The online Volunteer schedule opens on Feb 1st. Join other moms (and dads) who help at the sale in exchange for early shopping privileges, and earn a high percentage on your sold items. PLUS each Volunteer receives 2 tickets for Saturday's Half-Price Presale! Bring your items tagged, clothes on appropriate size hangers prepped & sorted by gender & size. You put your items out on the floor by category and size. Please allow 45 minutes. If your items are all tagged to go half price and donate you can use our Express Drop Off for FREE! Express Drop Off: If you're in a hurry, we can help. You simply unload your vehicle and we do the rest. The cost for this service is $10 per 100 items. Find more items to sell? You can bring them to the mid-sale drop off and still make the sale! Mid-Sale Drop Off: Friday, April 5th | 5pm-7pm for everything EXCEPT hanging clothing. Pick up all unsold items - Sunday, Apirl 7th, 7:00pm-8:00 pm. As time allows and depending upon how many Helpers we have, we will continue to sort other items by Consignor number. Your Consignor check will be emailed to you after the sale. IMPORTANT: At 8:01 p.m. remaining items are donated to charity. Sorry, no exceptions. Magic Eraser-gets off scuffs on shoes/toys, crayon marks—it’s a miracle worker!! Clear packing tape- get a better brand—it’s worth it, I promise! Tagging gun-OPTIONAL. Makes tagging clothing easy, but you have to be careful to place the barb in the tag at the neck or in the armpit seam of the garment. Be picky. Look at your clothing items as if you were going to purchase them for your children. No stained or damaged items will be accepted. Please bring top quality freshly cleaned clothing items. Replace missing buttons, sew loose hems and seams, and clip loose threads. Remember to button all buttons, snap all snaps, zip all zippers before you arrive at drop-off. This will ensure that the clothes you are hoping to sell will look their very best! The newer the item looks and the better it smells, the better it will sell. Hangers : Please hang clothes so the hanger hook points to the left (like a question mark). Please hang size 0-4 clothing on child-size hangers. Infant clothes hung on adult hangers makes it very hard for a shopper to see its true size. You want your item to sell and look the best it can! Clothing that falls off the hanger onto the floor does not sell well-or at all! Old Navy and many outlet stores are great places to get free hangers. Wal-Mart & Target sell child-size plastic tube hangers at a great price. Try Old Navy they sometimes give away their hangers for free. Clothing Sets: Sets tend to sell better (under size 6) so match things up if you can. Again, all garments should be hung with the hanger hook pointing left (hanger should resemble a question mark when looking at the front of item). Safety pin to attach clothing sets securely with bottom garment hung on the backside of the shirt at the top of the hanger. This is the best way so both pieces can be viewed without separating them. Onesies and Sleepers must be hung on a hanger. Clothing items in baggies will be charged $1.00 per bag to be put on a hanger and tagged. Sports Uniform Shirts and Tshirts We can not accept personalized little league sports shirts, Upwards, Vacation Bible School, Elementary spirit wear type shirts. These types of clothing items will not sell! Pants: Pant-clip hangers are great but if you use a standard hanger, simply use two safety pins to attach the waist of the pants to the top part of the hanger (the 2 slanted sides), then place tape over the pins to prevent sliding. Price: Remember hanging items need to start at $3. If your single hanging item will not bring $3 then match it will something else to bring your starting price to $3. Make sure you match items of the SAME SIZE! Tag: Attach tag with a safety pin to the label or upper right of the shirt or upper right front of pants. You can place a piece of clear tape over the pin for extra security. All seasons of maternity items are accepted, but must be in excellent condition. Please do not bring out-dated maternity clothes; they will not sell. We will now be limiting our 'regular brand' clothing, such as Old Navy, Motherhood, Liz Lange, etc., to 20 items per consignor; however, 'boutique brands', such as Pea in the Pod, Pickles & Ice Cream, and Mimi, will be unlimited . Please be picky and bring only your BEST, up-to-date maternity clothing! Please secure items to the hanger with safety pins since they have a tendency to fall off the hanger. Nursing bras should be placed in zip-type bags and securely taped over the zipper with the tag on the outside of the bag, affixed with clear, packing tape on a hanger. Please check the Consumer Product Safety Commission website for any recalls on your items. 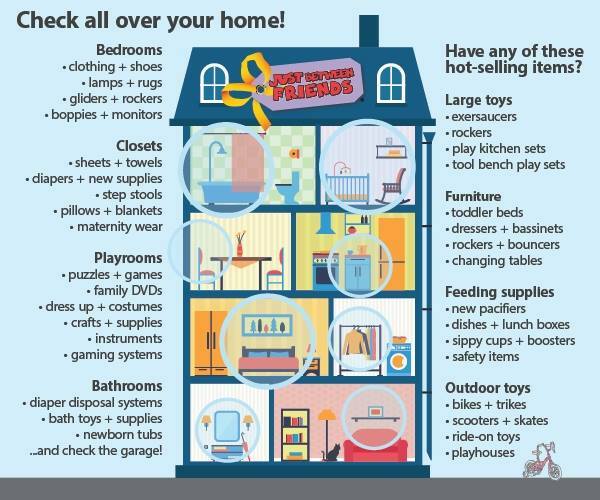 Like you, we want to make sure that everything we sell is safe for our children and families. Clean all toys and baby equipment thoroughly. Stained, dirty, or any items in disrepair will not be accepted at the sale because they do not sell. Please test to make sure that all toys and equipment you bring are working properly. IMPORTANT: Battery-operated toys must include working batteries (these can be purchased inexpensively at any dollar store). JBF will replace the batteries in any electronics, toys or equipment found on the sales floor without working batteries (JBF does not sell anything that we are not certain is in working order). If an item does require batteries, the Consignor will be charged $1/battery for the battery sizes we have available at the sale. If batteries are unavailable, the item will be removed from the sales floor and returned to the Consignor. Place all small parts belonging to toys/equipment in zip-type bags and tape over the closed zipper with clear packing tape. Fasten the bag securely to the item with zip ties, tape, or ribbon. Items must include ALL working parts. NOTE: If there is a question about an item, Consignors will be called to answer any questions. Games and puzzles should have ALL pieces and be in boxes with the lids taped closed. Plastic wrap is helpful to wrap around puzzles to keep pieces in their places. Shoppers appreciate it when you note on the tag "includes all pieces" or identify on the tag any non-essential missing pieces. Group several small items together in plastic bags (rattles, small books, puzzles, toys, etc.) and price the contents of the bag as one item. Please list all items on the tag, if possible; otherwise include a list inside the zip-type bag, facing outward. Remember to tape the bag closed. When labeling and pricing books, please attach your tag to the book with blue painter's tape, making certain that it cannot be removed BUT PLEASE DON'T USE EXCESSIVE TAPE. Do not use Scotch, masking, or double-sided tape because these adhesives tend to easily tear the book covers . Books can also be packaged in zip-type bags with the tag taped to the outside of the bag with clear packing tape. Multi-Piece Item Tagging Instructions: For non-hanging items with multiple separate pieces, put a tag on EACH piece. Fill out the first tag as normal, but include "1 of X," where X is the number of pieces. On all of the other tags, type your consignor number, the description, and "2 of X," "3 of X," etc. DO NOT write the PRICE on any tag except the first when you are selling multiple pieces for one price.Multi piece items that will not fit into a bag may be attached together with zip ties. HANG EVERYTHING! Blankets, bibs, socks, underwear, onesies, sleepers, crib sheets, changing pad covers, nursing covers, car seat covers, baby carriers, shopping cart covers, bath towels, burp cloths, receiving blankets. Unsure if you should hang, post a question on our Facebook Communication Page! Things on a hanger are easier to SEE, SHOP and SELL! *We will be unable to accept any bagged clothing items, including onesies, sleepers, and pajamas. All clothing must be hung on a hanger. 1. Complete the registration process! • Print all relevant documents and complete them before you drop off your items. 2. Increase your check by 10%! Join the Team & Consign. • Consigning Team Members receive 70% (rather than 60%) of each sold item! • Team Members are invited to the exclusive Team Member-only pre-sale for half-price items! • Your time is limited? Choose a" 6-hour Team Member for an 8-hr. pre-sale pass," or a "Husband Helper" shift. • Swap child care with a friend so both of you can Help. • Have FUN and make new friends as a Team Member. 3. Tagging Strategies & Process. . .
• START with your largest items. Get them out of your home and get more cash. High chairs, activity centers, portable play pens, strollers, outdoor toys, etc. . . . start here! • Tag clothes last due to the sheer volume of clothes. • Check for recalls . . .even on items you don't suspect. Don't spend time on stuffed animals, bedding (sheets accepted), mattresses, or out-of-season-wear. • Tag boy's size 3T & larger clothes before girls' clothes. Particularly, boy's pants are in demand! 4. Space your tagging out over 5 days . . .
• DAY 2: CLEAN IT OUT! Go through every closet, under each bed, dig in the garage, and every drawer....pull all items that are not sellable. Items that have holes, missing pieces, broken zippers, toys that don't work, all have to go...bag it, give it away, or take it to the dump. • DAY 3: HANG IT! First claim a space for all your quality JBF merchandise, somewhere that is somewhat protected and clean. (This is only for a few days, no large commitment needed.) Now purge the toys, the clothes, the sports/gaming equipment, and more that is ready to sell. One thing I have learned, is that no matter how many toys I sell, there are always too many toys! Place all your clothing items on hangers (be sure the hanger is pointing to the left forming a ? when looking at the front of the garment). Put together outfits, check for little stains (bleach pen or Spray 'n Wash with Oxy!!). Items that are wrinkled can be ironed OR try the Downy wrinkle release ---gift from Heaven!!! Remember to pin items that might get bumped off the hangers. Hang or stack neatly all your items. WALK AWAY. • DAY 4: PRICE IT! LOG IN to link in upper right hand corner of this page, then click ENTER MY TAGS to type in your items' info. In the order that your items are stacked or hung, complete each tag appropriately.... KEEP YOUR ITEMS IN ORDER. Type a thorough description, check "donate" and "discount" (or not), set a fair price (appx. 1/3 of retail; see Pricing Guidelines). Click the box next to each tag to print on white cardstock, then cut tags (usually 6/page). Take your completed and in order stack of tags and find a safe place to put them. WALK AWAY. • DAY 5: PIN IT! Pull out your nicely organized stack of tags, and go to your nicely organized stack or row of items. Now simply take the first tag to the first item and pin, continue on down, pin, pin, pin, pin, etc. (This is where a thorough description on your tags helps you, just in case items or tags get out of order) When you get to shoes, use ribbon or zip-ties to tie the shoes together and pin a tag. Some toys and large items will require packing tape; some items need to go into zip-type bags. • If barcodes are so dark that there is not clear, white space between the lines, the scanner will not read those tags. Solution…change your printer setting to “Draft” for a lighter shade. • Click on the Toolkit icon to see how you can categorize your items (e.g., donated, sold/unsold, categories such as clothes) and search by keywords (e.g., Disney, shirt). Export a report and you can sort by any category...including an itemized list of your donations for your taxes! • Watch the very helpful Youtube videos under Preparing Your Items. • Use coupons! Office supply stores often have weekly $5 or $10 coupons for card stock, packing tape, and sometimes, TONER. Fabric/hobby stores may have coupons for ribbon, safety pins, and tagging guns (use only on seams or under collars as they leave holes in garments) & barbs (inexpensive on eBay). Sunday newspaper circulars often have coupons for gallon zip-type bags. Get batteries for toys at dollar stores. Well, the videos on the Video Library pretty well explain and show it all! • Put in batteries so shoppers see that all bells and whistles work. If batteries are missing or dead, you will be charged a $1/battery. • Include all pieces of games, puzzles, or craft sets. If instructions are missing, download and print instructions. • Before you enter any clothing tag information, view each garment in natural light to catch any stains. You will save time tagging clothes and shoes that will be returned to you during the inspection at drop-off. If in doubt, throw it out. • Complete each column in myjbftags. "Category" and "Size" provide drop-down choices. • Under "Item Description," be as detailed as possible. “Old Navy green cargo pants” helps the Shopper looking for a particular brand or cut (Slim/Husky). A thorough description also helps us match lost tags with the correct item. • $3 minimum price on clothes . At JBF-Denton, onesies must be hung on hangers. We do not accept onesies bagged; they do not sell well when bagged. 9. 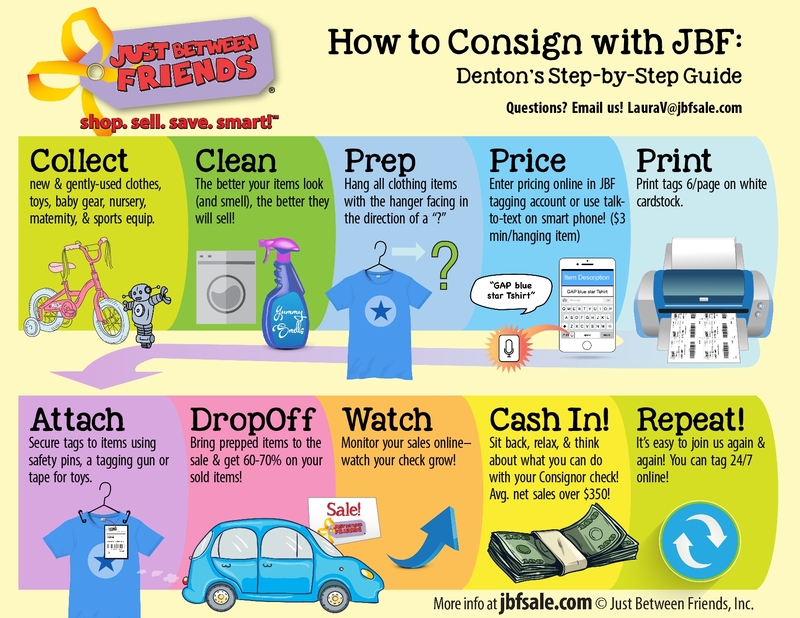 Be a Successful JBF Shopper! • Help. Consigning Team Members shop up to TWO days BEFORE we open to the public and BEFORE the 300+ Consignors and 300+ Guests and the 200+ First Time Parents, Grandparents, and Teachers. As a consigning Team Member you will be among the first to shop from the largest quantity and best quality of items. • Have a list of what you need. a. Clothes – have inseam, waist, and shoe sizes written down. Bring a measuring tape or piece of string the length needed. Outline your child’s foot on cardstock for correct shoe selection. Consider shopping a size above for some of the clothes for those unexpected growth spurts that could occur before the next JBF sale. Stock-pile! b. Toys/Games/Books - think Holiday and Birthdays that will happen before the next sale. Many items are NEW, so it’s a great opportunity to buy some fantastic presents (for your children and their friends, as well) at a fraction of the cost. c. Research retail price of some of the larger or specific items you are shopping for so you recognize a great bargain when you see it! • Fill out your pre-sale and Consignor/Friend passes! We will be checking them at the door, so don’t let us slow you down!! • Grab a couple of Hold Tags and fill out your name & cell number. Team Members will help you fill out the rest as you find items you want to purchase. A Hold Tag allows you to put larger items in our Hold Area and continue shopping. You pay for the item, then bring the receipt to the Hold Area to pick it up. • Grab a shopping cart or a large, blue shopping bag. • The larger and more unique items sell first. Shop for clothes last since there are so many options among clothes. • Compare the quality and price of similar items for the best value. The early shopper will get the best selection, quality, and price. • Consignor Pick-up is Sunday evening. • Consider donating your clothes and you won’t even have to think about Consignor Pick-up. Indicate that you want to donate your items by marking them as such when you are tagging your items. About two weeks after the sale when the dust has settled, print a Donated Report from your tagging account and put in your Income Tax file. • Our local charities that will be accepting our donations. How much CA$H you can make? Become a JBF Team Member (help at least 4 hours at the sale) and ONLY 30% of your consignor sales check will go to help cover the cost of the sale event. Tagging site is always open. Use your cell phone to tag. It's so easy! *We do the advertising, selling and clean up for you. No more sitting in a cold/hot garage for three days--letting strangers know where you live or arguing over prices!! You bring your items and set them out at the sale, the rest is done for you! *By prepaying your fee, the Consignor show-up rate tends to be much higher. Prepaying your fee will help us know how much rack space we need & let us know that you will be dropping your items off with us. It also helps us to make the sale the best it can be because of committed consignors! *Quick and easy barcoding system to prepare tags and monitor your sold items during the sale. You control the price of your items. Also, your items will be viewed by thousands of shoppers at the sale. How would you like to reach hundreds of area moms with your family-friendly business? We understand how difficult it is to start and operate a small business and we want to help you succeed. Our primary target audience is moms and dads with children fron infants through pre-teen who reside in the broad Denton area. We bring our target market into our venue on Friday-Sunday. Multiple space option are available, just email Amber at amberbirmingham@jbfsale.com for details. *If your school, church, Mom's group, scout troop, or other community organization wants an easy fundraiser, consider JBF! *Register your group as a Consignor and have those participating use that account to tag the items they wish to donate to your group. It is helpful to appoint a couple of people as "taggers" and have others simply drop off their items, already on hangers, to the taggers. *Then, the taggers just drop off their items at the scheduled time and wait two weeks for your check made out to your organization! **Consider this. . .our average gross sales/Consignor is over $250. Multiply that by the number of folks participating and you have . . .money for your group! Questions? Contact Amber! There is a limit of 20 maternity items per consignor. Please don't bring any women or men's clothing as it will get pulled and isn't accepted. Have items you'd love to get some cash for, but are too busy to tag? Being a VIP Consignor is for you! Sign up ASAP! Limited spots are available, VIP Application Here! Deliver your clean, sorted, hung clothes/toys*/items to the designated VIP Tagger by the appointed date. The VIP Tagging team tags your items. The tagger then takes them to the sale, puts them on the sales floor, AND you make 40-50% of what sells!! You will be given a pre-sale pass to attend the Consignor PreSale and we give you 1 Friend passes! You can DONATE your unsold to our local charity partner! You can collect your tax deduction document from Denton County Friends of the Family's Thrift Store, Upscale Resale, at 920 Dallas Drive, Denton. Enjoy your clean closets and drawers, and cash your check! THIS SALE WE ARE ACCEPTING 20 OF YOUR BEST MATERNITY ITEMS & 20 PAIRS OF YOUR BEST SHOES. ALL SEASON CLOTHING AND SHOES. 8:00PM 4/2 - 20 Hour Sr. Team Leader earn 85% of sales earned plus Presale Pass plus two guests to shop at 8pm on 4/2 and discount sales the night prior and/or one hour ahead of all shoppers. We accept Cash, MasterCard & Visa. Parking is Free! Ready to make more money & shop earlier?